Meal Notes: I would be hard-pressed to name my favorite cuisine, but I can say without hesitation that Cajun/Creole food makes my top 5. Although this recipe is on the easier, faster, healthier side of New Orleans fare, it still packs a spicy, mouth-watering punch. It can make a full meal for 3-4 people - or amp up the healthiness factor by serving it with a side vegetable like roasted broccoli. Source: The Best of New Orleans: A Cookbook by Brooke Dojney. I picked up this cookbook at the wonderful Garden District Book Shop on my first trip to New Orleans, almost 10 years ago. It’s a sentimental favorite, but also objectively awesome! Prep: Dice onion, green bell pepper, and celery. *** Minced garlic. Thinly slice scallions. Drain and coarsely chop the can of whole tomatoes, setting them aside in a small bowl. If necessary, peel and devein the shrimp. Make rice, following package instructions. Saute Vegetables: In a large skillet, melt the butter over medium heat. Add the onion, bell pepper, celery, and garlic. Cook, stirring frequently, until vegetables begin to soften (about 5 minutes). Make Sauce: To skillet, add the tomatoes, shrimp stock, paprika, salt, thyme, cayenne, black pepper, and bay leaf. Reduce the heat to low and cook for about 25 minutes, stirring occasionally, until the sauce becomes quite thick. Cook Shrimp: Add shrimp to the skillet, stirring occasionally, until shrimp turn pink and are opaque (about 4 minutes). 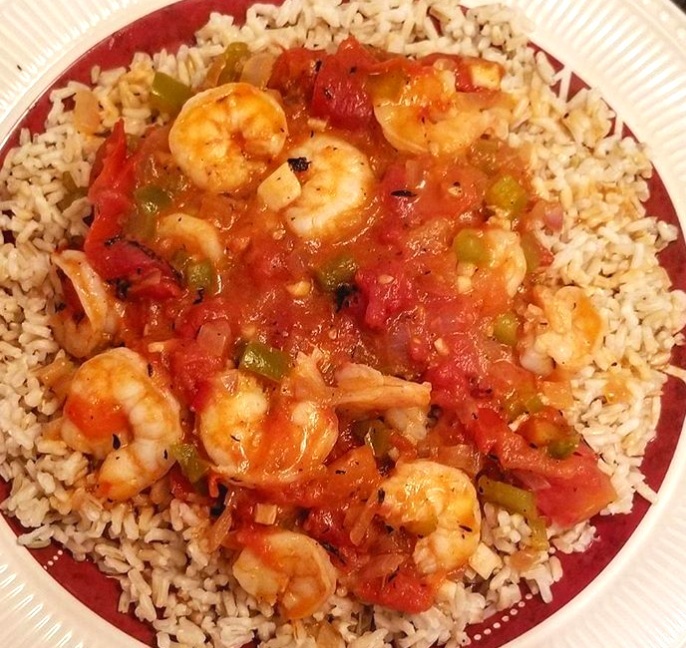 Finish: Spoon the shrimp and sauce over the hot rice. Sprinkle with the sliced green onions. *What type of shrimp should I use? See my note at the bottom of Lemon Butter Garlic Shrimp & Asparagus. **Substitute for shrimp stock: I have never been able to find shrimp stock at my local grocery store, so I typically substitute seafood stock and the recipe still comes out great. I’ve read that another possible substitute is clam juice, although my grocery store, unfortunately, doesn’t carry that either. ***Diced onion, Green Pepper, and Celery: Fun fact - these three ingredients form the base of so many Cajun dishes (gumbo and jambalaya to name just two) that they’re regionally referred to as the “holy trinity.” This nickname pays homage to the mostly Catholic roots of Louisiana, while the combination of ingredients itself honors the state’s French heritage, offering a twist on mirepoix - the mix of diced onions, carrots, and celery that forms the base of many classic French dishes.